Looking for a cost effective shipping alternative to your USA and International customers? Are you a Toronto based vendor selling small products online (Etsy, eBay, Shopify, etc)? Is your storage space limited? Too far from the post office? Too busy focusing on your business rather than spending time packing and shipping? Are you frustrated with the high cost, slow speed, and lack of tracking with Canada Post shipping to the USA and Internationally? If this resonates with you, we can help... Our core business is making and selling dogtags from Mydogtag.com and over the past 10 years we built an efficient and cost-effective fulfillment system to ship our products to the USA and around the world. Now we are offering other small-business vendors the opportunity to take advantage of our expertise and infrastructure by letting us handle your order fulfillment in conjunction with our own. 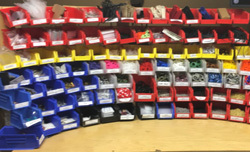 Warehousing of your products, or if your products are customized you can drop them off on an as-needed basis. the USA with tracking number at considerably less rates and delivery time than Canada Post. internationally (with partial tracking) via Asendia at considerably less rates than Canada Post. within Canada (without tracking) at the same rates as Canada Post. Summary email after every shipment with your customer's USPS tracking numbers. Optional return address at our Mydogtag.com physical location (or use your own return address) for undeliverable packages. Rapid integration or migration from your existing fulfillment procedure. 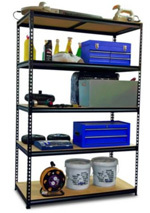 Products that require additional labour to assemble or customize are billed at $30/hour, or a negotiated per item fee. We can offer in house Laser Engraving and Metal Stamping of certain products. Monitored Alarm system with indoor and outdoor security cameras. Bondable and Insured for liability and loss. Is your business a good fit with us? Small products that fit in a standard #000 or #00 padded envelope. Average value of your products is less than $30, but no more than $200 per package. Average weight of your packages is less than 100g, but no more than 500g. Our location at 926 Wilson Ave, Toronto is convenient for you. By fulfilling through us you will save considerable time, effort and money compared with doing-it-yourself via Canada Post or a courier service. One time setup fee: $100. HST is added to our service prices and Canadian postage. We use Chit Chats Express package service that picks up orders from us Mon/Wed/Fri morning and drives them across the USA border that same night be entered directly into the US Postal Network in Niagara Falls USA where they are scanned and tracked. We use industry standard stamps.com for printing USPS postage with tracking. Compare that with Canada Post where the smallest USA Light Packet costs $7.18 plus $.40 for an envelope for a total of $758, just for shipping!BUT you still have to warehouse your items, pack it yourself and take it to the Post office, AND there is NO tracking and can take twice as long to be delivered! You get all these extra services with us for less than Canada Post shipping costs alone!. 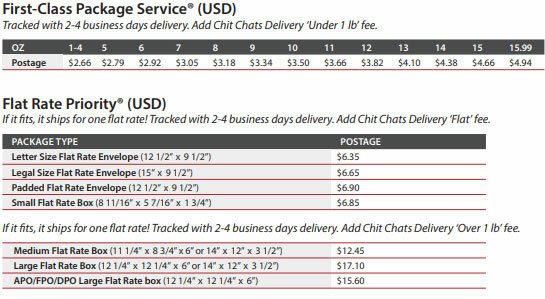 We use Chit Chats Express package service that picks up orders from us every Mon/Wed/Fri morning. These packages are sent using Asendia Priority Airmail Worldwide which are partially tracked (until they leave the USA). Asendia expedites international packages within the US and has partnered with local carriers in the destination country for the final leg of delivery. By tapping into their vast international network the results are quick and reliable. 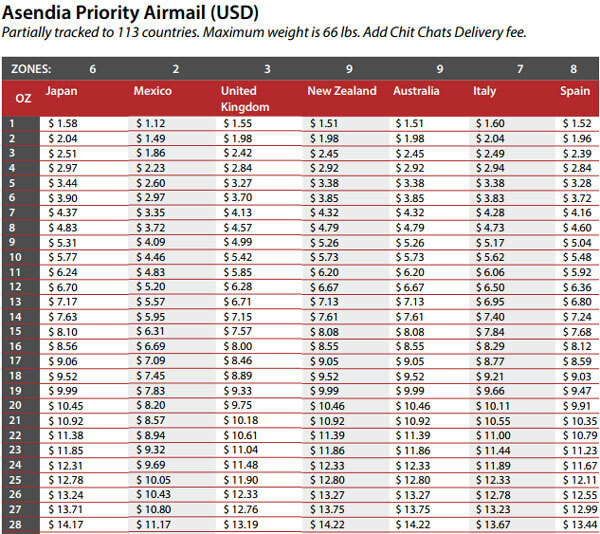 Postage rates vary from about USD$1.50 to USD$4 depending on the destination country. A CN22 customs form is included with the label. Delivery to European countries generally takes about 2 weeks. All other countries can take 3 to 4 weeks. The table below shows typical pricing. Compare that with Canada Post where one International light packet costs $9.20 plus $.40 for an envelope for a total of $480, not only is the total price more expensive you still have to pack it yourself, fill out a CN22 customs form, and take it to the Post office! We generally only ship packages in Canada that that are less than 2cm thick so that they can be shipped within the oversize letter-mail stream (rather than the parcel stream). However, accommodations can be made. Since we ship with Canada Post, you are not particularly saving on postage costs, however the time and effort you save in packing and drop-off is considerable! In order to fulfill your orders we require that you email us a CSV file up to 3 times per week with your order information. We can work with any structure (i.e. Shopify, paypal, ebay, custom, etc) and will restructure the data to import into our system. The order information must contain the recipients name and address, and the retail value of each sku. We pre-weigh all SKUs so that total package weights are determined programmatically when printing postage. Order information must be sent to us electronically (i.e. emailed CSV file, or API integration with your shopping site). We do not offer customer support directly to your customers. We guarantee that your packages will be shipped on Mon/Wed/Friday if received before 7AM the same day. We do not guarantee actual delivery (even on tracked packages). Lost, stolen and returned packages are your own liability. Reshipping of returned packages are re-billed at the original rate. We do not accept dangerous, illegal, or copyright infringing items. You need to arrange for delivery of your products to us. Since US postage is charged in USD, it will be converted to CAD at the time of billing based on the Bank of Canada's monthly average rate for the period. Please contact us for more information or to discuss using our services. Please send us an email to fulfillment@mydogtag.com and provide your phone number so we can call you back.